LONDON--(BUSINESS WIRE)--Technavio has announced the top five leading vendors in their recent global safety needles market report. This research report also lists 17 other prominent vendors that are expected to impact the market during the forecast period. The global safety needles market is expected to witness a steady growth during the forecast period. The majority of the growth is expected to come from the increased prevalence of chronic diseases such as diabetes, increase in hospitalization rates, and largely due to the enforcement of sharps safety laws in the majority of developed countries, mandating the use of safety-engineered devices like safety needles. The global safety needles market is highly fragmented with many global, local, and regional vendors offering a broad range of safety needles to end-users. Though these companies have strong positions when compared with Tier II and III vendors, they are slowly losing their significance due to increased competition from local and regional players. “The technological advances, favorable guidelines from regulatory bodies regarding the use of safety needles and new product launches will increase the competition among the existing vendors,” says Barath Palada, a lead orthopedics and medical devices research analyst from Technavio. With the regional vendors posing stiff competition for global players, especially in emerging and developing countries, the global players are focusing on developing innovative products, such as new generation microneedles and fully automatic safety needles to retain their positions in the market. Medtronic is one of the leading medical devices company, which is into medical technology, services, and solutions. The company has a broad range of product portfolio, which are categorized as Advance Surgical Technology, Cardiac Rhythm, Cardiovascular, Diabetes, Digestive and Gastrointestinal, ENT, General Surgery, Neurological, Patient care, Patient Monitoring, Respiratory, Spinal & Orthopaedic and urological & Uro-gynecological. BD is a medical technology company that manufactures and sells a broad range of medical supplies, laboratory equipment, devices, and diagnostic products. The company’s diverse product portfolio is categorized into diagnostics, biosciences, and a wide range of medical devices. Retractable Technologies develops, designs, manufactures, and markets safety medical devices for the healthcare industry. The company markets its products throughout the US. Its products include VanishPoint syringes, Patient Safe syringe, and EasyPoint syringes. The VanishPoint syringes are designed to prevent NSIs and promote single use. Terumo started its business from the sales of the Japanese-made thermometer and later started manufacturing and marketing medical products and medical disposables and equipment globally. The company operates its business through three companies: Blood Management Company, Cardiac and Vascular Company, and General Hospital Company. Smiths Medical is a medical devices manufacturer that provides innovative solutions to the healthcare market. Its products are used primarily in post-operative care during recovery, in surgery, in critical and intensive care, and in home infusion therapies. The company is a subsidiary of Smiths Group. Become a Technavio Insights member and access all three of these reports for a fraction of their original cost. As a Technavio Insights member, you will have immediate access to new reports as they’re published in addition to all 6,000+ existing reports covering segments like medical imaging, oncology, and vaccines. This subscription nets you thousands in savings, while staying connected to Technavio’s constant transforming research library, helping you make informed business decisions more efficiently. 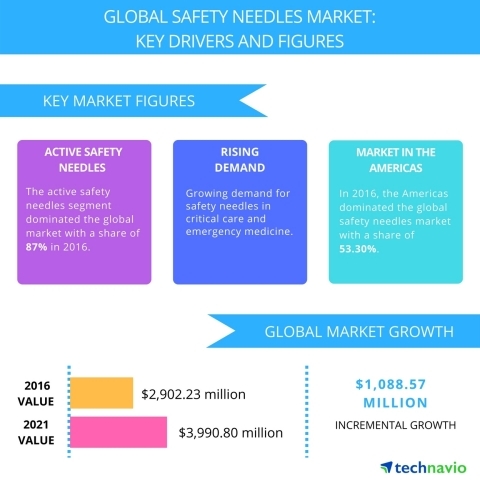 Technavio has announced the top five leading vendors in their recent global safety needles market report from 2017-2021.